This handsomely designed picture book biography of writer and scientist, Anna Comstock, is truly inspiring. The narrative is just the right mix of information that never falls flat in the telling. Born in 1854, Anna’s observational skills allowed her to discover nature’s secrets. From camouflage to pollination, Anna absorbed it all. She loved nature so much she decided to go to college to learn more of its secrets. Despite the fact that women were not encouraged to seek higher education, Anna attended Cornell University. 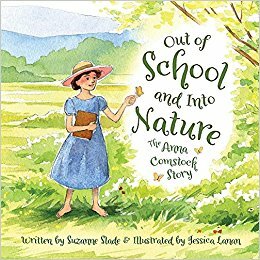 After graduation, Comstock would go on to write and illustrate nine nature books and initiated a nature-study program for teachers in New York State through Cornell. Lanan's colorful, watercolor illustrations strengthens this book’s appeal, as does the added engravings of Anna Comstock's art. Quotes from Comstock are set off from the rest of the text in a larger font. Back matter includes an author's note and quote sources. I just read this story - I LOVED it! I highly recommend it. I hope you enjoy it as much as I did, Linda.